Robert Mizrachi has been having a very tough year on the tournament circuit this year, but all that changed when he arrived in Aruba. Mizrachi held the chip lead after day 2, 3, and 4 of the event and was still the chip-leader going into heads-up play with Brandon Hall. 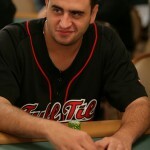 However, Hall was able to overcome Mizrachi’s hot-streak, and beat the poker pro to capture the Aruba title. According to Poker-King.com, Mizrachi and Hall cut a deal to chop the prize-money at the beginning of heads-up play: Mizrachi received an unspecified amount more than Hall, and $60,000 was set aside for the actual winner of the event –giving the two players something to play for. This entry was posted on Sunday, October 11th, 2009 at 8:05 am and is filed under Poker News. You can follow any responses to this entry through the RSS 2.0 feed. You can leave a response, or trackback from your own site.